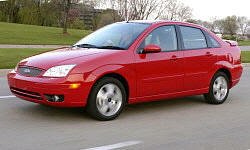 I'm looking at a used 2006 Ford Focus ZX5 SES. It has 93,000 miles on it. In general, isthis make/model reliable? What's the upkeep? We have a 2005 S model ZX4 (wife's car), and the only problem we had with it we caused by not performing the maintenance on the automatic transmission. We also have a 2007 SES ZZ3 with a stick (my car) which has been totally reliable. Both cars have about 82000 miles, and have had the brakes done. They are fun to drive, the trunk in the S is really nice since it's so big. Both are really good in the snow. My wife and I would definitely buy them again. I have a 2007 Focus ZX4 SES. The car has about 75,000 miles. Other than regular maintenance, brakes, oil changes, tires, etc, the only problems were a burnt out taillight and one headlight, so very reliable and fun to drive. We had the first year model 2000 we bought used for my son - many issues. I bought a 2007 model and had no issues until my son totaled it around 100k miles. I bought my daughter a used 2005 and had zero issues until I traded it in 2011 once she let me take it back. Bought a 2009 model new and my daughter now has this one with almost 100k miles without issues. Just don't overpay for it! I bought so many since they were very inexpensive cars. I paid $12k for my new one in 2009 and stopped buying the Focus when they redesigned them with an msrp nearing $20k. We had a 2003 Ford Focus SE ann it had the 2.o sohc and just did the normal maintenance , oil and filter every 3000 used full synthetic with Lucas oil additive and I think it had 180,000 when we sold it . Had to do some other repairs also like rear wheel bearings that come in the whole brake drum and if you do the front disc brakes yourself be very careful with the 2 slide bolts for the brake caliper . If you don't torque them you will strip them out and end up buying the whole expensive part or a thread repair kit .